Join the fun with GoSports newest bean bag toss game - Bullseye Bounce! 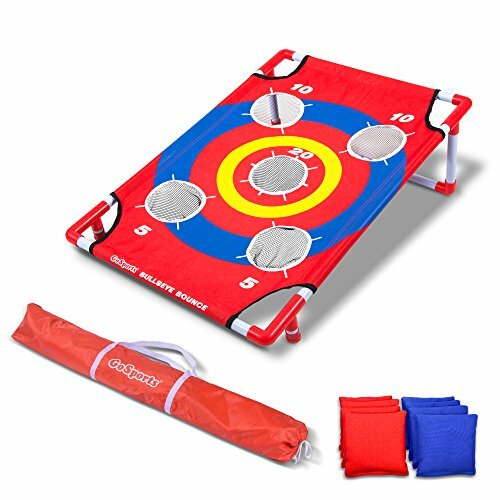 The game comes with 1 3'x2' foldable score target, 8 sturdy bean bags, a portable travel carrying case, and rules with multiple fun ways to play. Bullseye Bounce is perfect for family gatherings, BBQs, camping, and more thanks to its lightning fast setup and lightweight design. The game is fun for all ages and offers 3 different game styles for added value and to keep kids and adults playing for hours. Plus, the different score value targets give kids a fun way to practice math skills actively, sharpen their hand-eye coordination, and grasp competitive team gameplay. Now enjoying some fun in the sun at your beach day, picnic, or BBQ is effortless with the Bullseye Bounce game set!